Absolutely. 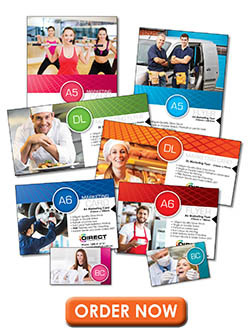 We have created a Sample Kit with a variety of sizes and stocks. Simply go to our "Contact Us" page and from the drop down menu select "Order Sample Kit", enter your details and we will post you out our Sample Kit in the next mail. The Sample Kit is free of charge. What types of paper or card stock can I order? We only use the highest quality stock. We keep prices low for our customers by having a limited range of stocks. All our standard stocks are FSC certified. We aim for 24 to 48 hours to process, print and dispatch your job (artwork must be uploaded before 11am). If you are ordering a standard product (excl. booklets), we aim for 3 to 5 working days delivered to your door. If your order requires extra finishing it may delay delivery by a day. We will send you an email notification for your job when it is dispatched. If you have any issues please contact us right away. We guarantee the quality of our printing and we want to know right away if a quality control issue has occurred. Please call us on 1300 41 76 51 or email us at admin@directmarketinghub.com.au outlining the issue and one of our customer service staff will respond to you personally to fix the problem. It’s extremely rare, but if we can’t fix the problem – we will refund your money or offer a print credit. I am not confident about doing this - can I get help? You certainly can. Just call us on 1300 41 76 51 and one of our Customer Care team will walk you through each step. Once you have put through your first order you will find that it will be much easier the next time around. What if I’ve uploaded the wrong artwork file? Call us as soon as you realise the mistake and we will try to remove the file from the system before it goes to print. Due to our tight turnaround times, in some cases it may be too late to replace artwork and you will be charged so please be very careful when uploading your artwork. Unfortunately once an order is placed, it is immediately scheduled in the print queue and in most cases can’t be cancelled. We hope you understand, as our priority is to keep turnaround times as fast as possible for our customers. Can you do my artwork? Yes we can. We offer two types of artwork - Pre-designed Templates and Custom Designs. Pre-designed Templates are a great option when you are running low on time, have a tight budget or just needing some inspiration. We let you know up front how much it will cost. We can also arrange for you to include stock images in your marketing piece if you don't have any of your own for a very small fee. Our graphic designers can also create a unique custom design for you using your existing branding or create a whole new look for your business. Can you fix my artwork? Hmmm tricky question. It depends on what program your artwork was originally created in. From experience we know that most times our talented graphic designers may spend less time recreating your artwork than it would to fix your original artwork. Plus you may find you will get a much more professional result. If however your artwork requires a minor adjustment and it was created in a compatible layout program then it would be highly likely that we would we be able to amend the file. Nothing! We have FREE delivery. There are no additional or hidden costs. You certainly can. Once it is dispatched (by freight) you will be emailed a confirmation email with a consignment number and the name of the freight company. What if my order arrives and it is damaged? We do everything possible to reduce the arrival of damaged goods, but damages do occur sometimes. In the first instance you must contact us by email admin@directmarketinghub.com.au detailing the damage. Please take a digital picture of the damage for our insurance and for any claims against the courier. Please do not dispose the item as we may require its return (if return is required we will arrange return shipping.). Once we have been notified (and have received the images of the damage) we will replace the damaged goods as soon as possible. We accept Visa, Mastercard, Direct Deposit and very shortly Paypal. We use a secured system for handling online payments through the ANZ. We do not have access to or store your credit card details. [faq_question] => Can I get samples? [faq_question] => What types of paper or card stock can I order? We only use the highest quality stock. We keep prices low for our customers by having a limited range of stocks. All our standard stocks are FSC certified. [faq_question] => How long will my order take? We aim for 24 to 48 hours to process, print and dispatch your job (artwork must be uploaded before 11am). [faq_question] => Do you offer a guarantee? Please call us on 1300 41 76 51 or email us at admin@directmarketinghub.com.au outlining the issue and one of our customer service staff will respond to you personally to fix the problem. It’s extremely rare, but if we can’t fix the problem – we will refund your money or offer a print credit. [faq_question] => I am not confident about doing this - can I get help? [faq_question] => What if I’ve uploaded the wrong artwork file? [faq_question] => Can I cancel my order? [faq_question] => Can you do my artwork? [faq_question] => Can you fix my artwork? [faq_question] => Where do you deliver to? [faq_question] => How much will my delivery cost? [faq_question] => Can I track my delivery? You certainly can. Once it is dispatched (by freight) you will be emailed a confirmation email with a consignment number and the name of the freight company. [faq_question] => What if my order arrives and it is damaged? [faq_question] => What payment methods do you accept?